Our host for this indulgent evening was none other than Etienne Sipp, the great, great grandson of the founders of the original Sipp vineyard, Louis and Louise. Etienne possesses all the qualities you would wish for from a wine-maker: a background in chemistry, extensive wine knowledge and an even greater passion for his subject, excellent English coupled with French charm, and a wonderful sense of humour. Aiming for purity, authenticity and elegance in his wines, Etienne Sipp uses organic farming methods to bring out the very best in the fruit, the vineyards being awarded full certification by ECOCERT for the 2008 vintage. Louis Sipp is considered to be amongst the very top of the 1000 wine producers in the Alsace region. Wines from the area are often described as aromatic as they have such distinctive fruit aromas and flavours, such as lychee in Gewurztraminer, which combine beautifully with delicate rose petal fragrances. These unique tastes and aromas often match very well with spicy food, so on this occasion our tasting menu was provided by The Red Fort, a sophisticated Indian restaurant in the heart of Soho, known for its Mughal Court cooking. We started things off with a pop – a lovely, refreshing Louis Sipp Crémant d’Alsace. This sparkling wine is a blend of Pinot Blanc, Auxerrois, Chardonnay and Pinot Noir and is perfect as an aperitif. Then came the Louis Sipp Riesling “Nature’S” 2008. This was the first vintage to be certified organic, and produced this fresh, lively Riesling, showing stone fruit on the palate and gentle, floral aromas on the nose. The ‘Nature’S’ range was created especially to demonstrate the result of organic wine production methods in the finished product. Etienne says this means ‘the fruit is laughing’ and if the wine is anything to go by, happy fruit makes great wine! 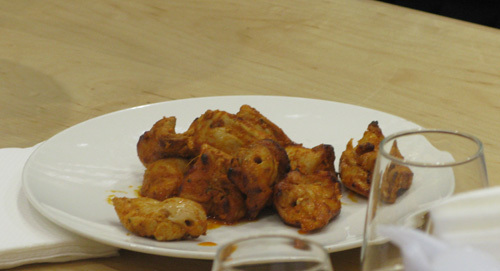 The next wine tasted was the Louis Sipp Pinot Gris “Nature’S” 2008, matched with a delicious Murgh Tikka chicken. The aromatic, pear nose and residual sugar on the palate balanced perfectly with the fenugreek and chili spices, and there was enough acidity in the wine for it to shine through, as opposed to getting lost in all those lovely spices. Louis Sipp Gewurztraminer “Nature’S” 2009 has all the typical qualities we know and love in a Gewurztraminer; an intensely aromatic nose showing rose petals and lychees, some sweetness on the palate and very moreish length! The Red Fort provided lightly spiced spinach & fenugreek patties filled with cheddar, onion and coriander which brought the best out of this delicious wine. Next in line were two Louis Sipp Grand Cru Kirchberg Rieslings, one from 2008 and one from 1999. The latter was rich and a touch waxy, very smooth and a real treat, without the typical petrol aromas but still fruit-driven and fresh. The 2008 was livelier with a hint of green apples and a mineral note. Both will keep for a while, so ideal for adding to your Riesling collection, but no crisis if you can’t wait and drink them tonight, you won’t be disappointed by either of these vintages. Spiced, roasted minced Devon lamb skewers accompanied the Grand Crus and were similarly subtle in flavour, again creating a great match. Roasted rabbit was served with the Louis Sipp Pinot Noir “Nature’S” 2009. Pinot Noir is often paired with game, so this was a little different from the usual with the chili spices and tangy flavours to bring out the delicate, sweet cherry nose of the wine with its smooth, fruity palate. We finished off with the Louis Sipp Gewurztraminer Vendanges Tardives 2007. This was extremely popular and delicious with mango Kulfi – an ice cream dessert. Etienne explained that despite being a vendanges tardives, or late harvest wine, the grapes are not picked too late so as to retain freshness and acidity, making a well-balanced, sweet wine, with good length and wonderful flavours including some refreshing, tropical fruit.